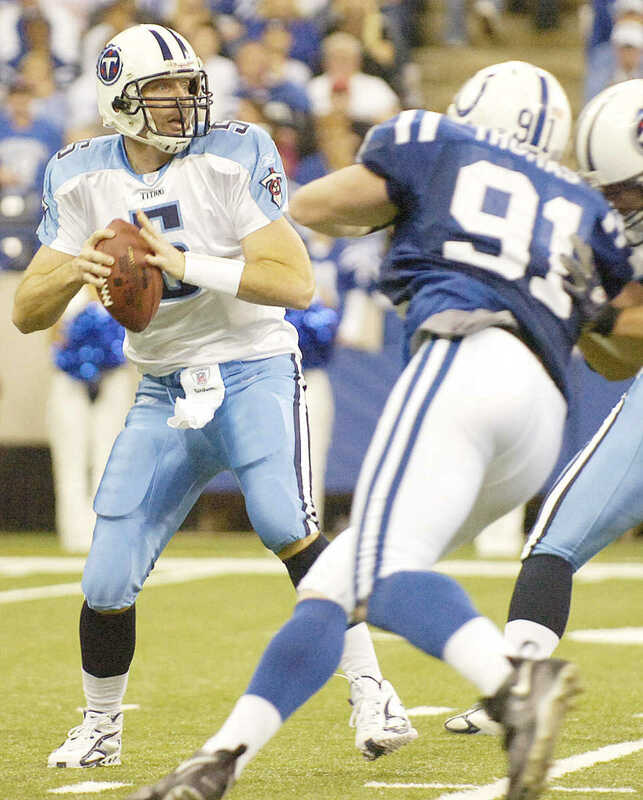 The Tennessee Titans held the Indianapolis Colts to just one touchdown to take a 16-10 win Dec. 30, 2007 in the final regular season game at the RCA Dome in Indianapolis. The Titans clinched their first playoff berth since 2003 with the victory. Tennessee Titans' defensive backs Cortland Finnegan (31) and Vincent Fuller (22) bring down Indianapolis Colts' running back Luke Lawton during their Dec. 30, 2007 game at the RCA Dome in Indianapolis. 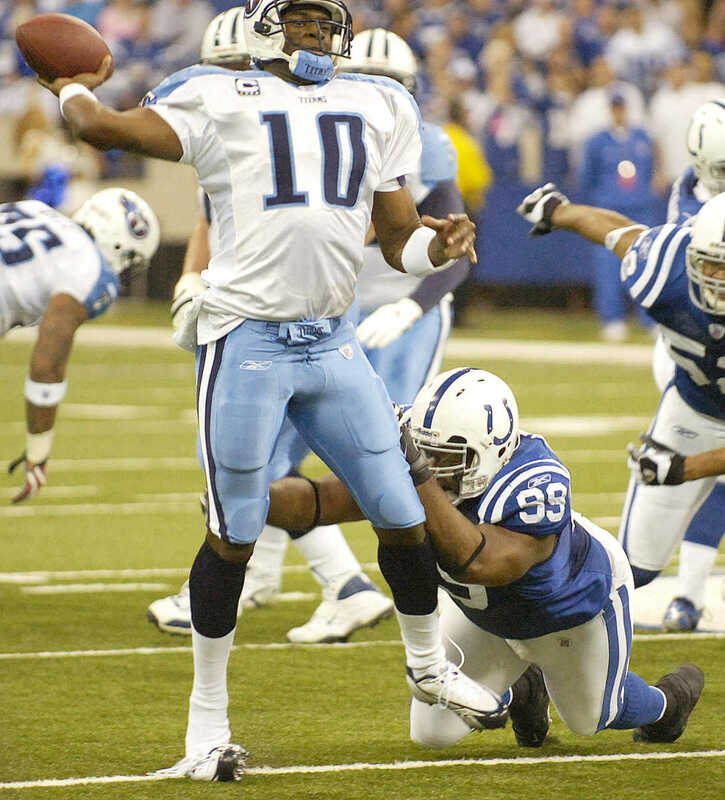 Tennessee Titans' quarterback Vince Young (10) is hit by Indianapolis Colts' defensive tackle Ed Johnson during their Dec. 30, 2007 game at the RCA Dome in Indianapolis. 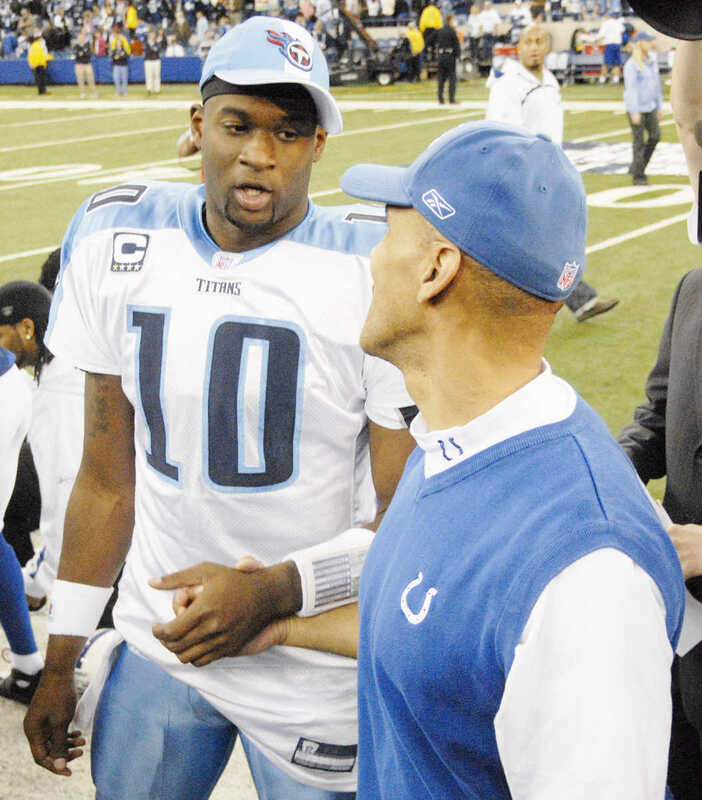 Tennessee Titans' quarterback Vince Young (10) chats with Indianapolis Colts' coach Tony Dungy after the Titans' 10-6 victory over the Colts on Dec. 30, 30, 2007 at the RCA Dome in Indianapolis. Tennessee Titans' defensders Michael Griffin (31) and Stephen Tulloch (55) bring down Indianapolis Colts' receiver Reggie Wayne during their Dec. 30, 2007 game at the RCA Dome in Indianapolis. 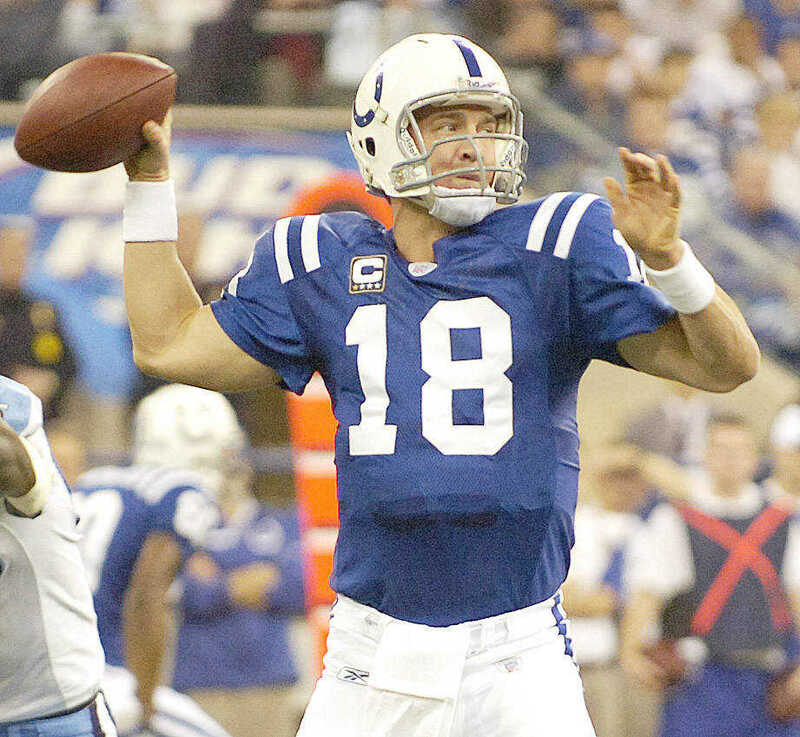 Indianpolis Colts' quarterback Peyton Manning gets ready to pass against the Tennessee Titans during their game Dec. 30, 2007 at the RCA Dome in Indianapolis. 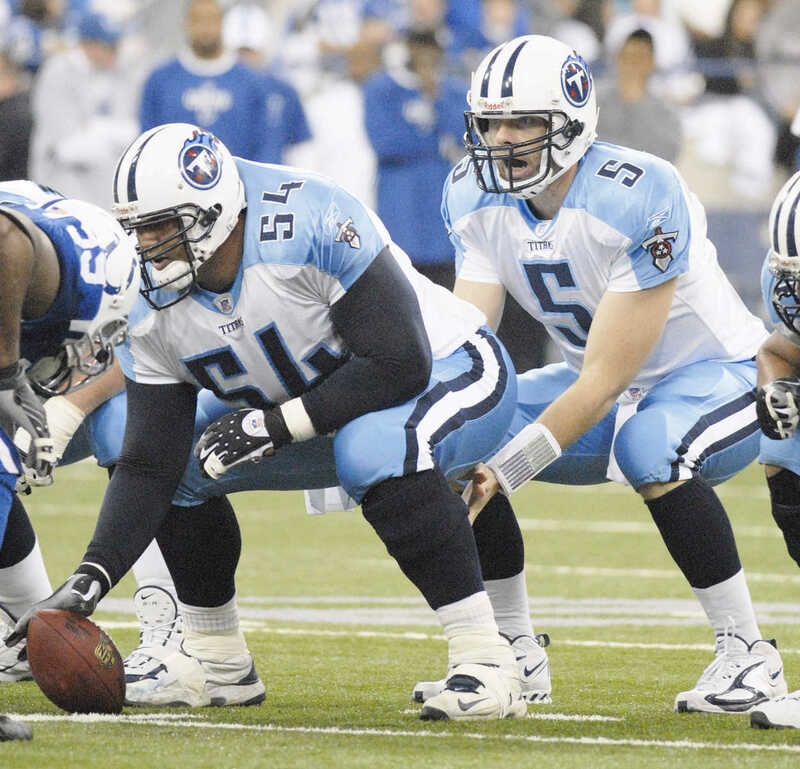 Tennessee Titans' quarterback Kerry Collins (5) awaits the snap from center Eugene Amano (54) during their game against the Indianapolis Colts on Dec. 30, 2007 game at the RCA Dome in Indianapolis. 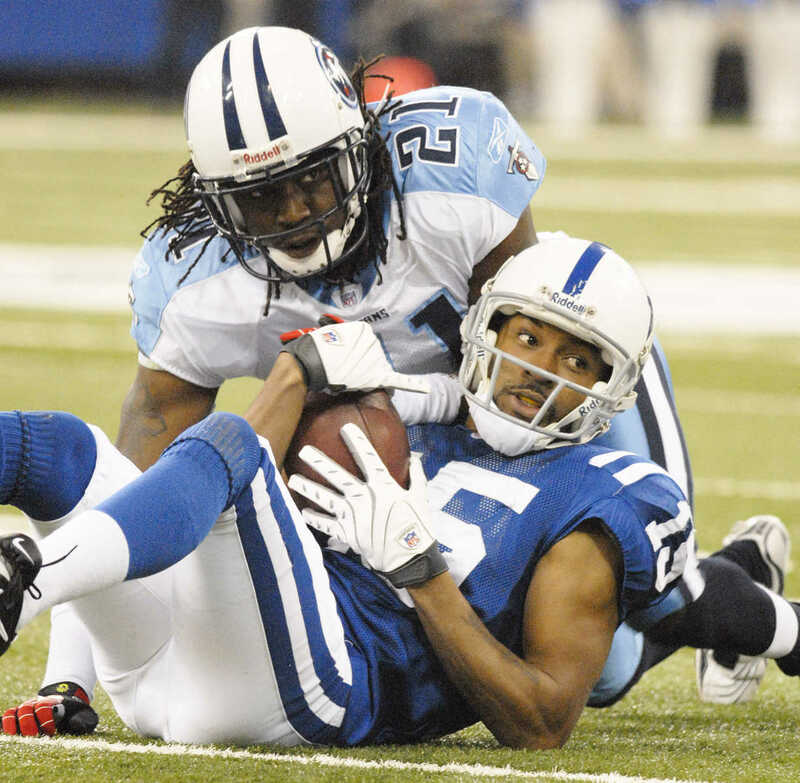 Tennessee Titans' cornerback Reynaldo Hill (21) brings down Indianapolis Colts' receiver Craphonso Thorpe during their Dec. 30, 2007 game at the RCA Dome in Indianapolis. 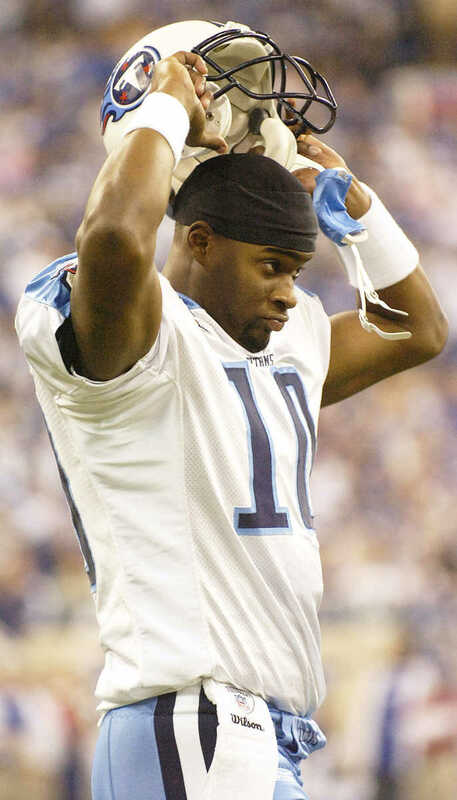 Tennessee Titans' quarterback Vince Young takes off his helmet as he heads to the sidelines during their Dec. 30, 2007 game against the Indianapolis Colts at the RCA Dome in Indianapolis. Tennessee Titans' quarterback Kerry Collins (left) is pressured by; Indianapolis Colts' Josh Thomas (91) during their Dec. 30; 2007 game at the RCA Dome in Indianapolis.